Coffee 101: What is Espresso? Legend tells us that the first coffee lovers were Ethiopian goat herders. These daring individuals first tried the berries of the coffee tree after watching their caffeinated goats dance with joy. Since then, coffee has become the second most popular beverage in the world. There are two ways to prepare a cup of espresso coffee. There is the simple brew method that has been around since the 9th century. Then there is espresso. Espresso is made with pressurized steam and finely ground coffee beans. Popular since its invention in 16th century Arabia, espresso is a highly concentrated drink full of flavor and caffeine. The difference between espresso and coffee may not be readily apparent. Many people who are just starting to explore coffee may even think it is the same thing! Nothing could be further from the truth. Many people first experience coffee from a home automatic drip brewer. These machines produce hot water, then slowly release it through medium ground beans. Most drip machines use a fine paper or mesh filter to keep the grounds out of the drink. The filter also captures the natural oils in coffee. This decreases the body of the drink, making it mild. The last widely used method is the percolator. These devices have a chamber for water and a chamber for coffee. A tube connects them. Water is heated to near boiling and forced up the tube. It drips over the grounds and back into the pot. Water can be pushed through the grounds many times to create a strong drink. It releases a very pleasant aroma, but can taste rather harsh. No matter what kind of drip brew method is used, it cannot produce espresso. From the word Espresso, it is less watery than any drip coffee. It has a rich, thick texture in the cup. Steam brewed espresso forms a rich foam on the top of the brew called crema. Crema is not dairy or any other additive. This thick froth comes from the natural oils in the coffee bean. Well made crema will range from dark tan to a mahogany shade, depending on the beans used. A modernespresso machine heats water to just below boiling under high pressure. Finely ground espressocoffee grounds are carefully tamped into the filter, forming a solid puck. Steam is forced quickly through the ground coffee. 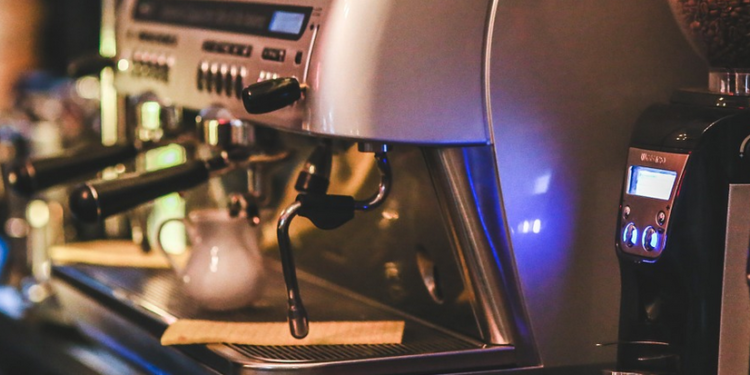 Most modern machines will also have a steam wand that is used to create lattes and cappuccino. A serving of espresso is about an ounce. It is sometimes added to drip brew coffee to increase its potency. It is most often consumed with added whipped cream, milk or other flavors. Some hardy few drink it straight. Ristretto. This is the first three-quarters of an ounce of a puck’s extraction. It is also called the short shot. It is widely believed to be the best coffee to drink straight. I wouldn’t know, I am not brave enough to drink it straight! Single Shot. Standard one-ounce per serving. Lungo. The long shot, this is one and a half ounces of espresso from a standard puck. Double Shot. Made with twice as much ground beans as the other shots, this is two ounces of espresso brewed at once. Coffee beans are like grapes. The taste depends on where they grow, what the weather was like and how they are handled. For these reasons, most espresso is made with a blend of beans intended to produce mild acidity, a full body and a balance of sweet to bitter flavor. Well-brewed espresso, unlike drip coffee, will have a complex flavor. Fruity flavors balanced with a bitter bite and a nutty undertone with a sweet and salty taste are all hallmarks of a good cup. The back of the mouth bitterness of espresso should be balanced with the front of the mouth sweetness. Bitter robusta beans are often used in espresso blends to bring that bitter taste out. Drip coffee blends rarely use robusta beans. It uses milder beans. Drip brewing can’t bring out the best in robusta beans. Espresso lovers often talk about its acidity level. It has nothing to do with a sour taste or pH. It has everything to do with taste. A high acidity coffee is one that tastes ‘bright’ or ‘bold’. A low acidity coffee is described as ‘smooth’. If the acidity is too low, the coffee may be considered ‘flat’. Coffee beans do contain a large number of phytic and tannic acids. Too much of them can raise the pH level and change the flavor profile. How much acid ends up in your brew depends on how it was made and the type of beans used. In general, darker roasts have a lower pH and a smoother flavor profile. Lighter roasts are brighter, with a higher pH. It depends on the roasting process. Espresso’s short brew time doesn’t generally allow many phytic and tannic acids into the brew. If the brew has a higher pH, the crema will look yellowish instead of dark. Large coffee chains offer many types of drinks made with espresso. Most of them have lots of sugar or flavored syrup. Traditional espresso is a simple drink. It is made with a shot or two of espresso and little more. Espresso Machiatto. Often made with flavored syrups and chocolate in chain coffee shops, the Machiatto is misunderstood by many. It is traditionally made with a single shot with a lot of foamed milk. Cafe Breve. Another simple drink, the Breve is a shot of espresso made with steamed light cream or half and a half. Espresso con Panna. A rich treat, this drink is made with a shot of espresso topped with a thick layer of whipped cream. Cappuccino. An Italian cappuccino is drunk only in the morning. It is also only made with steamed milk and a shot of espresso. It does not have dry foam or other additives. It’s very different from the American chain cafe drink! Cafe Latte. A sweet and mellow drink, a latte is another Italian morning treat. One or two shots of espresso are mixed with eight ounces of steamed milk. It is then topped with foamed milk. If you drink it without the foam then you’d call it a flat white latte. Cafe Americano. This is a cup with history. During World War II American soldiers in Europe missed their drip brew coffee. European cafes began to mix a shot of espresso with six ounces of water for them. The taste is somewhat like drip brewed coffee, perhaps a little better. 2 espressos are two shots and are more popular than single espressos. Regardless of the size, espressos are usually poured into a demitasse cups. Demitasse cups – are the small, often white, cups you see in coffee shops and restaurants and each holds 2 to 4 ounces of espresso. Other coffeehouses also offer single shots and lungos. For quality control purposes, many coffee houses choose to only offer double shots.